Nationals Park opens at 4:30 for a 7:05 start. I really wanted to get into the stadium around 5, but traffic complications hindered that mission. Due to Northern Virginia traffic, my 30-minute (when free of traffic) trip began at 4:30. And then the traffic made that trip a full hour long. 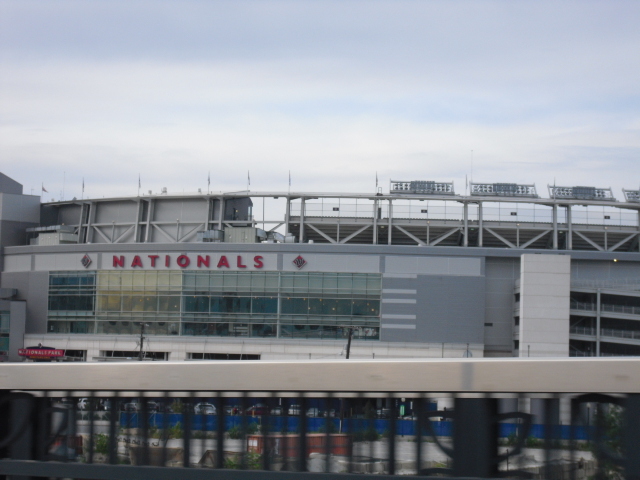 The good thing that came out of this was the fact that our approach to Nationals Park was much more scenic; we drove across the blue light-ribboned bridge outside the stadium. So that was our view of the stadium as we drove up. On a normal traffic day (even though D.C. traffic is never “normal”) we would get off I-395 and drive through run-down Southeast D.C..
We didn’t have tickets to the game, and box-office tickets are overpriced, so we consulted the “sidewalk entrepreneurs,” the euphemistic term for scalpers, and spent $20 each for tickets in right field. On my own fault, I overpaid. The scalper said the tickets were for section 139, and I thought 139 was a field-level section along the foul line, but I was two or three sections off. 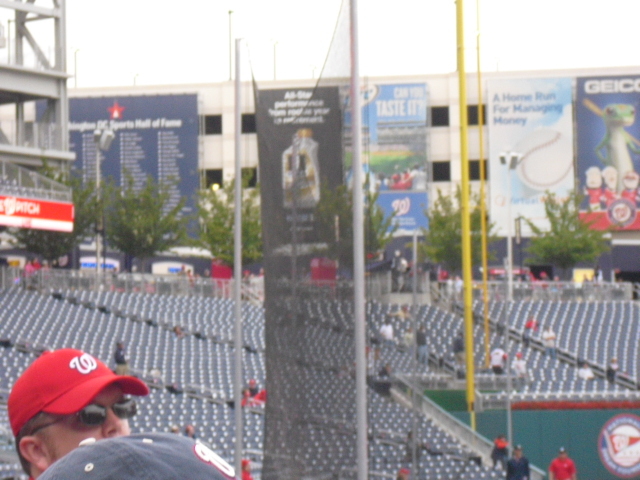 Instead, 139 is right on top of the Nationals’ bullpen, and underneath another section. As a result, you cannot see the jumbotron, and it would take a straight line drive for a home run to reach the section. Anyway, I still had about an hour of batting practice to have fun for my last game of the year, and my last Florida Marlins game ever (if you haven’t been following, the Marlins are changing their name from Florida to Miami next season). I decided to camp out at the Red Porch for BP because there was literally ONE other fan there interested in snagging baseballs. But even despite the fact that I had my teal Marlins hat on, and my Marlins sweatshirt, the Marlins pitchers were not interested in hooking me up with baseballs…darn. I have no clue why though, but it’s probably because I don’t look like a kid. I’m only 14, so I should be entitled to the same rights to receiving baseballs as kids. So finally I yelled out, “Sandy!” to Sandy Rosario (pictured above). Rosario was a September call-up, and I will guarantee you I was the only fan to call him by name last night. So I was very happy when he threw me the ball, but very mad by the way he threw it. It was the saddest toss from 60 feet away. He should have given more effort for someone who knew his name. The lollipop throw forced me to lunge out over the wall in order to make the catch. The only thing that allowed me to stretch without falling was the plexiglass on top of the railing. The pitchers in centerfield saw me get this ball from Rosario, who was standing in left-center field, and therefore were now LESS interested in hooking me up. But Gaby Sanchez came through for me with a line drive home run, which I had to move exactly 8 centimeters for. It was literally right to me. I took that 8 centimeter step to my right and reached out to make the catch. The ball was practically brand new, but it had the slightest bat mark on it, which you will see later. The Marlins pitchers in centerfield finally recognized one of their faithful as they cheered for me when I made the catch. That made me feel a little better, and I was content with having two baseballs. I was mostly content with having just the one that I caught on the fly. There were quite a few glove trick-able balls in the bullpen, but I did not want to make a scene (If I had gotten into the stadium earlier I would have used the glove trick). While I was looking around the stadium, I noticed on both the first base and third base side, there were large screens separating the stands from the field…annoying. A security guard later said that this game was the first time they had put up the screens, and were probably there to keep fans from interfering with players on the field during BP. And the groundskeepers took them down after the Marlins finished BP. Since I was satisfied with me loot, and had no intentions of pulling a Zack Hample (running all over the stadium asking different groups of players for baseballs), I made my way down to the Marlins dugout to see what I could do. Once I reached the dugout, I realized how AMAZING the weather was. A cold front recently reached the Eastern Seaboard and brought *chilling* 60 degree weather. And a slight breeze during Friday evening made gorgeous day even better. If I hadn’t been wearing my Majestic sweatshirt, I would be complaining about the chills right now, but the sweatshirt made my day that much more enjoyable. 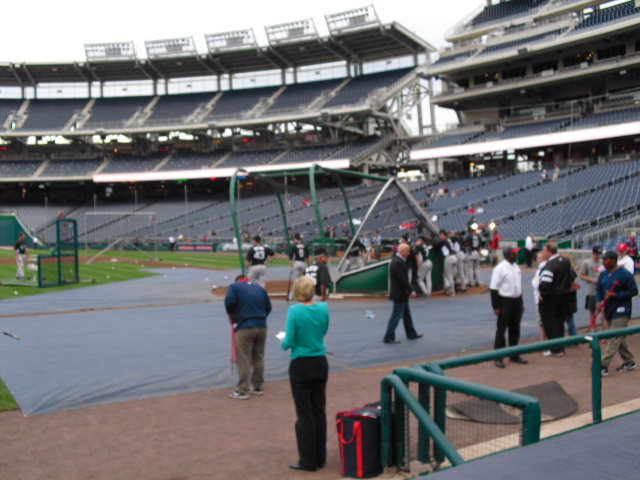 It must have been because of the weather, and/or the fact that it is September and neither the Marlins nor the Nationals will make the playoffs, that no one was there during batting practice. I mean, normally, there are at least a few ballhawks in left field and some kids or creeps getting autographs from players by the dugout, but today, none of these people were present. There were a couple families in the left field seats who had kids getting baseballs, but it was dead for the most part. After I had realized how awesome the weather was, and how empty the park was, something very peculiar, yet very amazing happened. The same group of pitchers, which I was previously upset with in centerfield because they hadn’t thrown me baseballs, and then happy with because they cheered for me after catching the home run, were still there. And Vinny Rottino, a September call-up and backup backup catcher (no typo), hit a hard line drive heading to center. The ball was clearly going to land in the batter’s eye beyond the outfield wall. But Clay Hensley, who was in that group of pitchers, threw his glove up and knocked the ball down. He did it so nonchalantly that is was hilarious. He and the other pitchers started cracking up. The comical event was cheered/laughed for by the few who saw it. 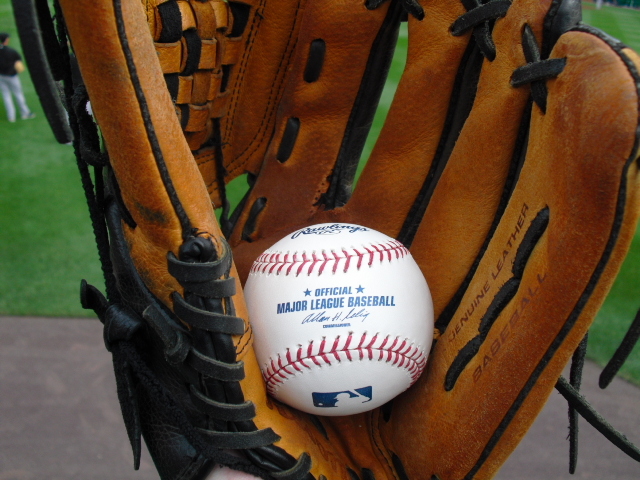 I’ve tried to knock down baseball projectiles by throwing my glove, and it’s not easy. Hensley has probably tried the same thing 50 times this year, and that was most likely the first time it has worked. Another very challenging thing is picking out one player to call out to when you have 40 choices. Every Marlins player stayed on the field for the entire length of batting practice, and they all came off at the same time. So instead of interacting with five players during BP, I had to pick one. I had previously decided it would be Matt Dominguez, so when the players came off the field I picked him out and shouted to him. He was compliant and signed a baseball for me, but to my dismay his signature is bland. The “M” is kinda fancy, and at least he added his number, but the thing that caught my eye was the fact that he added a “Z” in his shorthanded last name. That was sort of cool, but the signature as a whole is not. It was amazing how there were honestly no other people calling out to players. I guess you shouldn’t expect particularly large crowds for the Nats in September. After the hour and a half of chilling, literally, inside Nationals Park, I found myself able to upgrade my seat. Not legally, of course, but I was down by the dugout, it was ten minutes before first pitch, nobody was telling me to leave, and my seats were only decent, and a half-mile’s walk away. So I found a seat in section 114 right on the aisle and in a completely empty region of the stadium. By this time, happy hour fans had started trickling into the ballpark and filling up the seats. I was able to witness another peculiar/weird event down on the field, involving pitchers again. As part of rookie hazing, the Marlins bullpen pitchers wore colorful backpacks out to the bullpen. Lovely, isn’t it? Also, the Nationals have the coolest pump-up/intro/game time video EVER. The video has patriotic images and D.C. landmarks, along with clips of awesome Nationals moments. The music in the video sounds like action music from National Treasure. It makes you feel like the Nationals are America’s baseball team and guilts you into rooting for them because rooting against what is in that video feels like rooting against the country. That picture is showing the jumbotron during that intense video, and how empty the stadium was before 7:05. I stayed in section 114 for the first inning and a half, and then I walked around to 139, where my family was. Unfortunately, I got no foul ball action during my time in the lower section. After the 6th inning, my family, all four of us, migrated around the field to the 3rd base side, around section 110. We found an empty section of seats and parked ourselves there for the next inning. That was one of the only sections at that point that did not have a guard checking tickets, so we got in without a problem. About halfway through the seventh inning, I took my little brother Joe on a seat-upgrading adventure. We moved over about two sections for a few outs. And then moved diagonally down and closer to home plate. At the start of the eighth inning, we were about 20 rows up from the field and probably in section 113, maybe 114, I didn’t bother checking. And for the final inning, we scooted up as little as two rows at a time, about five times, until we were approximately six rows from the field. Recap: Our seats were $24 at the box office and 400+ feet from home plate, I spent just three or four innings there during the entire game and ended up with this view for the final out: Pure awesomeness! I snagged two baseballs at this game, the second of which was the first BP home run I have caught on the fly. And I got a previously-snagged baseball signed by a big-time 3B prospect for the Miami Marlins. As you may be able to tell from this photo, the ball on the left is severely grass-stained, and the ball on the right is the brand new-ish one I caught. If you can’t see it, I don’t blame you. It is just a few light brown lines right under the stitches in the center of the photo. And for the last time, I attended a Florida Marlins game. I’m just wondering, but did you mean that Nationals Park tickets are over-priced or if the box office tickets were overpriced compared to other sources? I personally think the best way to go would be Stubhub even with their crazy fees because tickets in the outfield are regularly listed at less than $10 a ticket. The only reason I buy tickets at the gate is that I have a college ID and get all tickets half off :). That sounds like a great deal for college students! I was implying that box office tickets are more expensive than tickets from “other sources,” to put it vaguely. I like stub-hub, but I’m not a big fan of outfield seats, or, by the same token, seats right behind home plate. But Nats Park is one of the cheapest stadiums around, especially compared to NY and Philly.